This resort’s motto is, “where luxury meets wilderness”, and it is very true. As you can easily see, fishing here is a long way from roughing it. This is 4- to 5-star lodging with 5-star meals prepared by a gourmet chef. 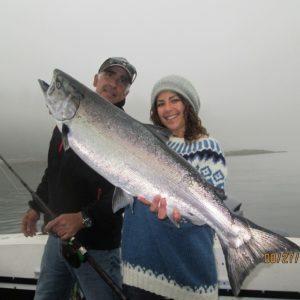 Add to that some wonderful king and silver salmon fishing, along with halibut, and top it off with world class scenery. 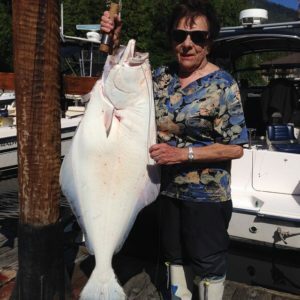 This is one of the finest saltwater fishing lodges along the Pacific coast of British Columbia. AND SINCE THEY ARE IN A “SOUND” (LARGE BAY) ON THIS RUGGED ISLAND’S WEST COAST, SHELTERED WATERS ARE AVAILABLE EVEN IF WINDS ARE HIGH. The facility itself boasts just over 17 guest rooms, all with water views, double beds, modern ensuite bathrooms, and luxury galore. You can walk from the Lodge about 100 yards to the marina (extremely secluded and protected from weather). You can sit outside on the patios, sip your favorite beverage, watch the eagles and just listen to the quiet solitude. Or take a kayak or paddle board out, jump in the hot tub, or walk part of the 17 miles of hiking trails. Even a whale cruise can be had at extra cost. Drinks done, go inside for a showcase meal with fine appetizers, entrees and desserts. They have a large wine list, including local wines from the famous vineyards of Vancouver Island. And this Chef will not allow a deep fat fryer! Top it all off with homemade breads and their tantalizing aromas. You will also be fishing from one of the best fishing platforms there is for these waters – namely from several 25-27 foot Grady White Sailfish models, equipped with dual 225 Yamaha outboards for safety and speed. 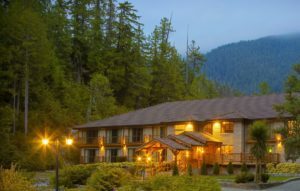 This Luxury Lodge offers some of the very best Salmon fishing in the Vancouver Island area – meaning some of the best in the world. 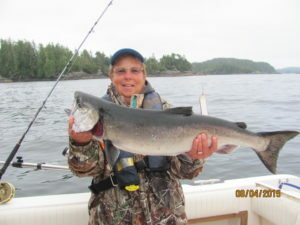 Numerous runs of salmon pass thru the area continuously from May through September. And their off shore reefs hold salmon nearly year round. This is the area where the majority of King Salmon migrate through – on their way down the coast to their home rivers. You will catch ocean fresh kings that have spent 3 to 6 years growing in the salt water to sizes from 25 to over 50 pounds and possibly much larger. Silver salmon (coho’s) start arriving in June and peak in late August. They are acrobatic, delicious, and range from 6 to 20 pounds. Hook one of these and you will have a ball! 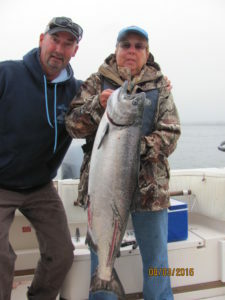 Other salmon species caught include pinks, sockeyes and chums. Perhaps the eating prize is the tasty halibut They typically range from 15 to 200 pounds and they really put a bend in the rod. Hook even a 50 pounder and you will have weary arms. And some awesome fillets. Add to that the hard fighting and ferocious looking ling cod, the tasty rockfish and other bottom species, and you will be reeling in fish all day long. If you plan to fish in July or August (two of the best months), you will want to book a year in advance. 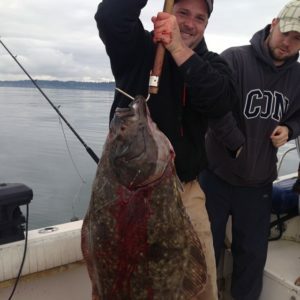 However, there are always salmon and halibut here, and there is usually good availability during June and September. No matter when you go, you will catch plenty of fish. 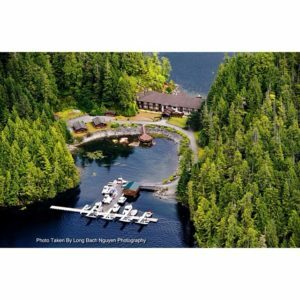 Most clients will fly to Vancouver and then hop on a float plane for a 45-minute flight right to the lodge. The charter cost is NOT included in the package, but the lodge will book the flight. If you catch an early afternoon flight, you should be landing your first fish that afternoon. The float plane center is about a 10-minute taxi ride from the Vancouver airport (or lodge can arrange a shuttle) and is a picturesque place with a pub to eat at and watch from if you have some time to kill. Alternatively, the lodge’s water taxi can pick you up from the harbor in Ucluelet for a 60-minute cruise to the resort, for no extra charge. On the way home, leave the lodge about 1PM (weather and fog allowing) and you should be back to the main airport by 3PM. Some folks overnight just in case of bad weather so they do not miss their flight home. That also helps ensure that any fish you are taking home arrive too. Normally your fish will be transported free of charge, unless overweight, but weight limits are generous. SAMPLE ITINERARY AND PACKAGE PRICING (based On 2 guests). Call for open dates and additional package pricing. ALL PRICES SUBJECT TO CHANGE WITHOUT NOTICE UNTIL DEPOSIT RECEIVED. ALL PRICES IN USD. Rates are based on double occupancy and a minimum three-night stay. Children’s rates apply to children 12 or under when booked with two or more adults. All rates are subject to applicable taxes. Water taxi pick up in Ucluelet is included in all package rates, floatplane transport is extra. Please note alcohol, massage services, applicable taxes and gratuities are extra. 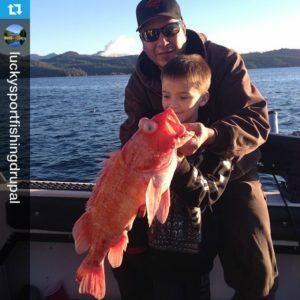 Fishing package rates are based on a maximum of 3 adults or 2 adults and 2 children 12 or under, per boat. DAY #1. Arrive at terminal in afternoon and take water taxi to lodge. Once you arrive, you get a tour of the resort, relax, maybe have a couple of drinks, and then enjoy a gourmet dinner. DAYS # 2-4. Up early for a light breakfast, then on the dock by 6AM. You will be furnished nice boxed lunches. You will fish until around 2PM, and then return for a great hot meal. Now relax, have some cocktails, and your guides will fillet and vacuum pack your catch for you. Enjoy a great dinner at 7PM. Then cluster around the fire pit with the other guests and swap stories, or jump in the Jacuzzi or hot tub or get a massage. will be loaded in Styrofoam coolers with waxed cardboard outside the coolers. You will depart between 12PM and 1PM. Weather can delay things (fog), so if you plan to fly out the same day, allow extra time. You should normally be back to the international airport by 6PM, barring weather issues. Most clients opt to overnight in Vancouver on the way home to avoid missed flights. TACKLE: All gear is supplied. recommend people dressing in at least 3 layers for fishing in the morning: t-shirt, long sleeve sweatshirt or button down shirt, with vest or fleece or light jacket over top. Remember, you can always take clothes off later in the day as the sun rises, but early morning temperatures can be cool. WE ARE YOUR ADVENTURE SPECIALISTS. • No cell service in the lodge but can sometimes be found offshore while fishing. • Other things to do, guided kayaking (extra); DIY kayaking, hike 17 miles of trails, arrange a whale and scenic cruise (extra); use their paddleboards.